Today in the evening service in church the pastor talked about day 4 in Genesis and that the universe and all the stars were created on one single day. When I came home from church Orion was up just over our home. 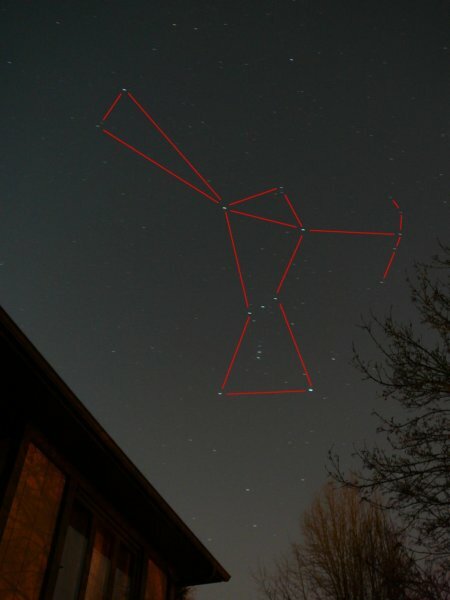 So I took out my camera and took an image of the constellation Orion (the hunter). Taken on 02-28-2010 with Panasonic DMC-TZ1, f/2.8, 60s exposure, 5mm (35mm equivalent on 35 mm camera), ISO-80. I just mounted the camera on a tripod and pointed the camera on Orion.